forms the foundation for all improvement efforts . It is an acronym for five Japanese words and denotes a step-by-step approach for developing a clean and well-organized workplace. The term workplace could mean shop floor, office, manager’s desk, garage, store or any other place. It is more than housekeeping. 5S is very popular in Japan and is becoming common in other countries too. 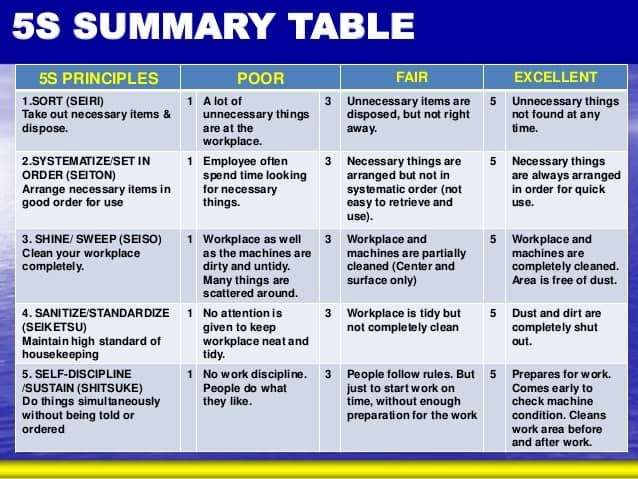 A well-organized workplace provides a healthy and safe work environment and also improves productivity by reducing time for locating tools and materials, damage to the materials, etc A well-designed and implemented program of 55 would instill discipline and change the attitude of employees toward work. It is considered one of the foundation level techniques for continuous improvement. pragmatic, it is hard to put them into practice. 5’S’represents five action items that ark initially done with some kinds of persuasion. However, these aspects should become a pan of the habit in individuals. distant future, or in greater quantities than necessary. The number of items required for a specific time frame should be decided. b) Fixing the quantities of items required in the distant future to be kept in the workplace. C) Taking out trash and rubbish from the workplace immediately. d) Prepare and circulate a list of items which are not required to all other departments / sections to identify what they can use. e) Attaching a big red tag to all such items indicating name, disposal procedure, and date of disposal and retention period (the period after which items will not remain in the workplace). This is the process of arranging all necessary items in an organized manner so that no time is lost in finding them. It involves deciding a place for everything and keeping everything in its place. a) Depending on the frequency of their use, shelf life, bulk etc., decide how and where the items would be placed in the workplace. For example, small tools can be kept in racks while big bulky ones may be stored on the floor. More frequently used items should be kept in the middle shelves of the racks. The principle is to store them as near to the place of use as possible to minimize searching and handling time. b) Use the first-in, first-out principle to prevent loss due to deterioration. c) Put labels on all items to clearly identify them. d) Store dies and moulds together along with tools necessary for setting them up. e) Maintain a dear space around the fire extinguishers and keep passages free. f) Clearly demarcate passages, work areas and storage areas. g) Design storage methods so that items are stocked properly and are not damaged. a) Undertaking cleaning of the workplace completely with the participation of everybody including top and senior managers. b) Implementing schemes in your own machine and work make employees responsible for the designed areas. C) Ensuring that machines and workplaces are cleaned daily. Cleaning means more than simply cleaning up the general environment. It also means guarding from dirt every single part of the item used, upon which our livelihood depends. In other words, cleaning is a form of inspection. The problems caused by grime, dust, and foreign matter are related to all aspects of accidents, defects, and malfunctions. The recent tendency among young people to disdain dirty work environments is affecting personnel recruitment. a) Decide a schedule specifying frequency and persons responsible for carrying out Seiri, Seiton and Seiso and ensuring that it is done according to the schedule. Make 5s a routine. b) Eliminate activities that make the workplace dirty and disorganized. C) Protect workers from dangerous and unsafe conditions. d) Standardize operations an daily maintenance procedures. e) Institute competition between various sections /departments for the best organized and maintained workplace – lay down criteria and determine the level of 5s activities in various workplaces. f) Managers should take note of the status in their visits to the workplace. This denotes the self-discipline acquired by practicing 4Ss continuously, spontaneously and willingly to make them a part of daily life. It involves establishing standards, educating and training employees to observe good work habits and obey the rules of the workplace.